These are changing times for the river cruise industry. So it was illuminating to hear what one of the originators of the burgeoning and increasingly popular sector is up to. Luxury river cruise company AmaWaterways invited World of Cruising to meet co-owners Rudi Schreiner and Kristin Karst aboard AmaPrima on a pre-season mini-cruise from Amsterdam. With no fewer than 23 itineraries covering 11 rivers around the globe, AmaWaterways claims it offers guests a river cruise that is not just a holiday but a collection of unforgettable experiences. 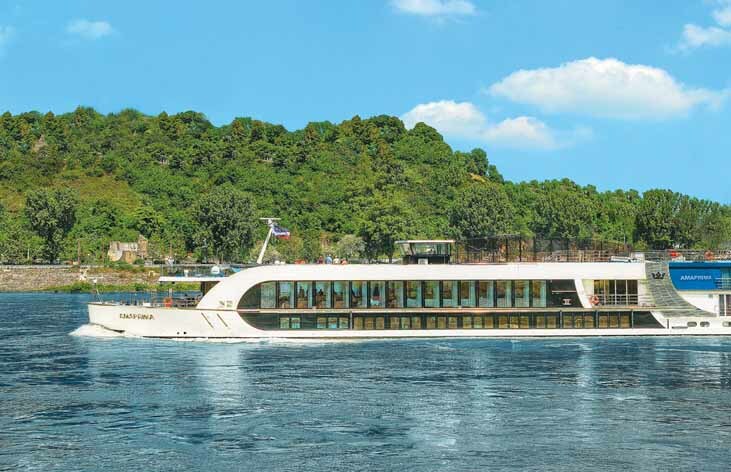 With a variety of sailings along the Danube, Rhine, Main, Seine, Mosel, Rhône, and Douro, all the company’s vessels feature French balcony staterooms – with the exclusive Twin Balcony concept on select vessels; complimentary high-speed internet and WiFi; recently-released movies, and a music library. There are also itineraries on the Volga River in Russia aboard AmaKatarina; exotic Mekong River cruises through Cambodia and Vietnam aboard AmaLotus and La Marguerite, and serene four-night sailings aboard Zambezi Queen on the Chobe River in Botswana. I saw all stateroom categories aboard AmaPrima, ranging from 160 ft2 staterooms with two windows, to 170 ft2 French balcony staterooms, as well as the signature twin balcony staterooms spanning between 210-290 ft2, culminating in the 300 ft2 suites complete with large bathtub and separate rain-shower. There’s a heated pool with swim-up bar on the sun deck and a small gym with Kinesis and Technogym equipment. Cuisine is a highlight of all river cruises. Aboard AmaWaterways vessels culinary creations from prestigious Chaîne des Rôtisseurs chefs feature in the main dining room. In the Chef’s Table Restaurant at the aft of the vessel, 28 guests can dine on a special menu once each seven-night cruise. AmaWaterways complimentary small group shore excursions provide a world-class land tour in every destination. There are ‘Gentle Walkers’ and ‘Active Walkers’ groups as well as a ‘Late Starter’ group. As befits the company that originated the concept of bicycles aboard river cruise ships in Europe AmaPrima has 30. Enrichment and Speciality Cruises are a hallmark of AmaWaterways and highlights for 2014 include a Knitting New Year’s cruise; Jewish Heritage cruises, and Wine Cruises. Also new this year, AmaReina and AmaSonata will sail in Europe as well as AmaPura in Myanmar. In 2015 there will be new Mekong cruises aboard AmaDara between Saigon and Siem Reap; while in Europe AmaVista and AmaSerena will join the fleet, AmaViola and AmaDessa will be introduced in 2016.